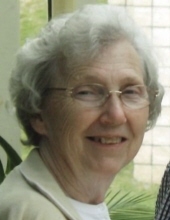 Joann Segars Osborne, age 82, of Norcross, Ga, passed away on Thursday, April 11, 2019. Joann was a member for over 6 years at Norcross First United Methodist Church. She loved teaching Sunday school which she did for over 30 years. Her interests were gardening and walking and a very special love for her grandchildren. A funeral service will be held on Saturday, April 13, 2019 at 11:00 am at the Peachtree Corners Chapel of Crowell Brothers Funeral Homes & Crematory. The burial will take place at Norcross City Cemetery. The family will receive friends on Friday, April 12, 2019 from 5:00 PM to 8:00 PM at the funeral home. Joann is preceded in death by her parents, Herbert and Thelma Segars; brother Jackie Segars. She will be greatly missed by her husband of 62 years, Grier Bascom Osborne; son, Dan Osborne (Vickie); daughters, Regina Hallman (Treg) and Michelle Quinley (Jeff); sister-in-law, Mary Alice Segars; grandchildren, Corin Havens (Reese), Tinsley Hallman, Savannah Hallman, Simeon Hallman, Lydia Donell (Ryan), Joanna Baldridge (Ben), Nicolas Osborne and Rebekah Guest (Connor), Sam Quinley (Ashton), Hannah Quinley, Morgan Quinley, Kenzie Quinley; great grandchildren, Trystan, Henley, Huxley, Bailey, Boaz and Banks. On-line condolences may be expressed at www.crowellbrothers.com. Arrangements entrusted to Crowell Brothers Funeral Homes & Crematory, 5051 Peachtree Industrial Boulevard, Peachtree Corners, GA 30092. 770-448-5757. To send flowers or a remembrance gift to the family of Joann Osborne, please visit our Tribute Store. "Email Address" would like to share the life celebration of Joann Osborne. Click on the "link" to go to share a favorite memory or leave a condolence message for the family.